You might do more damage to LPs by cleaning them incorrectly than by doing nothing! 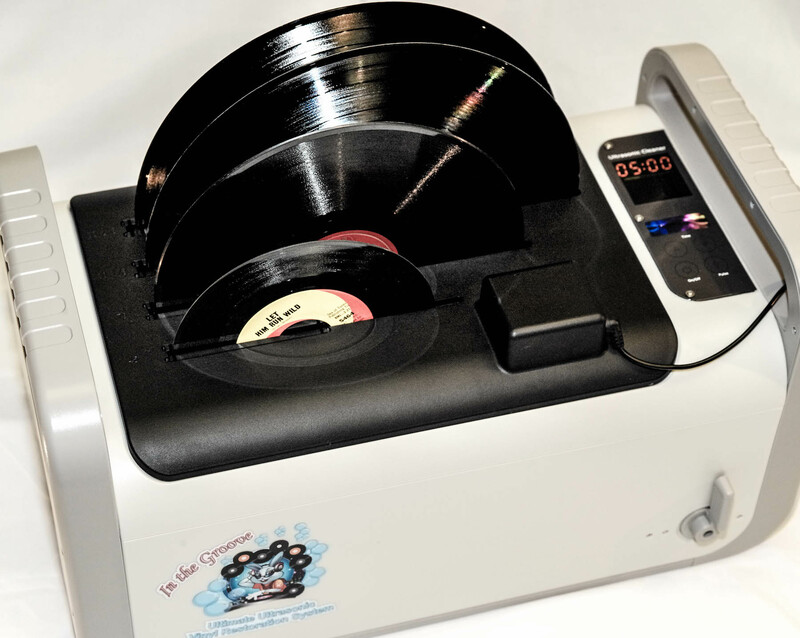 There is unique, deep research behind the process and materials in the Kirmuss KA-RC1 machine, which cleans three sizes of records with carefully-researched ultrasonic power, in a temperature-controlled bath with a very mild fluid and a technique that leaves no residue. Three disc sizes – 12″, 10″ and 7″ – can all be cleaned at once. The control panel shows time and bath temperature. ​”…it is a professional grade archival system…” Hifi Pig’s Oustanding Product award. Over four years of research are behind the ultrasonic process, the bath fluid and the materials used for manually lifting fungus, so-called mould release agent and any previous cleaning agents from the grooves. Some cleaning fluids clog the grooves with a residue and blow drying can leave that fluid and blown dust in the “cleaned” grooves. And some ultrasonic models can damage the vinyl with too-high a frequency. Kirmuss used underwater cameras to fine-tune the ultrasonic process, in which air bubbles burst and pulse distilled water mixed with a small amount of isopropyl alcohol – at 500 mph! – to wet deep into the grooves. 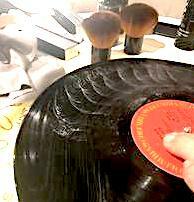 Full deep cleaning involves first washing the record in the machine to remove surface dirt then applying a special Kirmuss surfactant, brushed into the grooves with a very fine goat hair brush (supplied). Records previously cleaned, and even new ones with oils released from the vinyl in the pressing process, will produce a soft white ‘soap’, to be washed off with another cycle in the machine. Further cycles may be needed if more soap must be removed. Professor Lowell A Graham at the University of Texas, responsible for archiving recordings, wrote that he had tried many cleaning systems during 50 years but “…none of those systems have come close to the sonic benefits I am experiencing with this system” Read his letter here. The Kirmuss record cleaning machine is something of a bargain compared with others on the market – £1222 inc. shipping and a comprehensive package of accessories: cleaning surfactant spray (anti-bacterial and anti-static), fine goat hair brush, felt and carbon fibre brush, a large cloth as a work surface, micro-fibre cloth and stylus cleaning brush and fluid.